President Trump ran as a populist who would crack down on the Wall Street elite. Now, Trump's treasury secretary isn't just pushing to rip up the rules governing Wall Street, he's bragging about how such talk has lifted bank stocks. 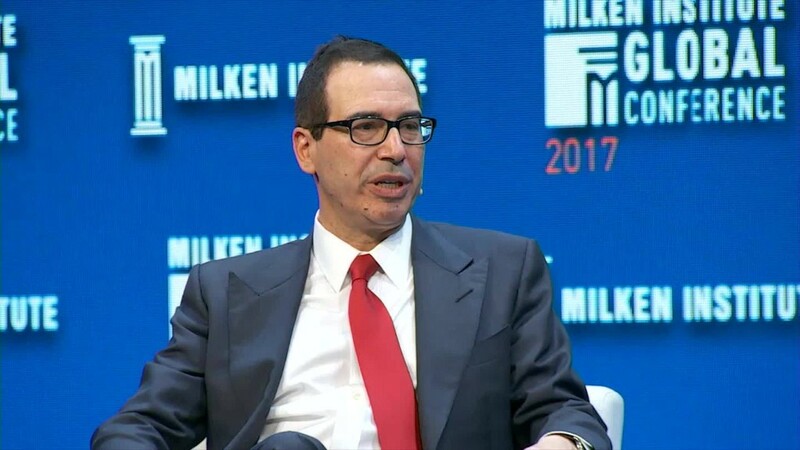 Treasury Secretary Steven Mnuchin reminded bankers and investors this week at a Beverly Hills conference that he's very focused on relaxing financial regulation. "I know there are a few people in this room who care a lot about that. You should all thank me for your bank stocks doing better," Mnuchin said at the Milken Global Conference. Bank stocks like Goldman Sachs (GS) and Bank of America (BAC) have indeed taken off since Trump's victory, many of them soaring between 20% and 40% apiece. The big bank rally has been fueled in part by Trump's post-election pledge to "do a big number" on the Dodd-Frank financial reform law. The comments from Mnuchin, a former Goldman Sachs banker himself, raised eyebrows on a few levels. First, they obviously stand in stark contrast with Trump's campaign trail vow to no longer let Wall Street "get away with murder." Mnuchin's comments also break with the tradition of treasury secretaries being extremely careful with their words. A single word from a treasury secretary has the power to move markets and few would want to be seen undermining their credibility or favoring one industry over another. "I cannot conceive of any of the 11 other secretaries I have known making such a statement," Larry Summers, who led the Treasury Department under President Bill Clinton, wrote in a Washington Post blog. Summers said there will likely come a time when a treasury secretary has to "invoke his credibility to support confidence in the economy, to stabilize markets, or to mitigate an international crisis." Another red flag, it looks like Mnuchin has personally benefited from the big rally in bank stocks. Mnuchin's ethics agreement called for him to sell much of his stock portfolio, but only within 90 days of his confirmation. Since he wasn't confirmed until February 13, the 90th day hasn't happened yet. Last month, Mnuchin filed paperwork indicating he sold out of many investments, including bank stocks, in March. For instance, Mnuchin sold between $1 million and $5 million of Goldman Sachs shares on March 22. Goldman Sachs closed at $231.07 that day, up 27% from the day Trump was elected. In March, Mnuchin also sold investments in CIT Group (CIT) for as much as $46.3 million. CIT Group is the bank where Mnuchin served as a director until he took his current job. Mnuchin sold the bank he led, OneWest, to CIT for $3.4 billion in 2015. Mnuchin also sold in March up to $5 million worth of stock in Berkshire Hathaway (BRKA), the investment vehicle run by billionaire Warren Buffett. One of Berkshire's biggest holdings is troubled bank Wells Fargo (WFC), which has enjoyed a 20% rise in its stock price since the election despite the fake account scandal. Earlier this year, Mnuchin disclosed a smaller investment of no more than $15,000 in Citigroup (C). It's not clear if he sold that investment. Mnuchin's ethics agreement allows him to keep in place an investment management entity he controls and completely owns called Steven T. Mnuchin Inc. Mnuchin did not reveal what investments that entity controls. Mnuchin has said he won't participate in any decisions that could affect those holdings.